Hero MotoCorp so far has been playing only in the 110cc scooter space with three offerings: the Pleasure, the Duet and the Maestro Edge. So the company’s step into the fast growing 125cc segment, which is set to cross the million sales per annum mark just next year, is an important one. And heralding that step is the Destini 125. Now we’ve seen this scooter before, at Auto Expo 2018, in the form of the Duet 125. But while its name might have changed, its purpose hasn’t: to cater to the family-conscious scooter buyer with a more powerful engine. One look at the Destini and you’ll immediately feel that from the front, it really resembles the Honda Aviator, with its all indicators and tonnes of chrome garnish (only on the Vx model though). Around the back, it’s got the familiar large indicators and tail light cluster that we’ve seen on the Duet 110. Even the main body panels, which are made of metal (along with the front fender), have been borrowed from its smaller sibling. The higher-spec Vx variant also gets more chrome garnish on the side panels as well as a dual texture seat. And then it also comes with blacked out alloy wheels, while the lower Lx variant has to make do with standard steel wheels. The instrument cluster features an analogue speedometer with a digital panel for the odometer, tripmeter, fuel gauge and a service reminder indicator. This cluster isn’t what you might call pretty, but it's quite large and very legible. Switchgear too is large and rather well designed, and tactile to use. Though there’s nothing offensive about the overall styling, it does look a little too familiar, and we don’t think it’s doing enough here to really stand out from the crowd. But we will say one thing though: the build quality is really top notch all around. Even though the design of the Destini might look familiar, what’s really new is the engine. It might have been derived from the Duet 110, but there are enough changes to qualify it as a new motor. This 124.6cc single-cylinder mill makes 8.83PS of power and 10.2Nm of torque. While its torque figure is at par with its competitors such as the Activa 125 and Access, it does make slightly more power than they do. But you won’t really feel this difference in power when you’re riding. The motor feels smooth and the scooter accelerates cleanly from a standstill, with the run to 60kmph coming up very easily. It even manages to pull comfortably when riding two-up, and overtakes never felt like a problem. Cruising at about 70kmph feels easy with this motor. We even saw about 85kmph on the speedometer for a short stretch, and we’re sure it can do a little bit more. But progress past 80kmph feels rather slow. And while refinement levels are high, the motor does start to sound a bit gruff at higher speeds. It might not excite anyone with the performance it offers, but we believe that this motor is more than adequate for its intended purpose: lugging families around the city without breaking a sweat. Now, one of the biggest features that Hero has been harping on about the Destini 125 is the inclusion of i3S (idle Start Stop System) tech. We’ve seen this before on the company’s small motorcycles such as the Splendor iSmart, but this is the first scooter in India that gets a start-stop system. When you pull to a stop and leave the engine idling for about five seconds, it cuts off automatically. To restart, you simply hold down either of the brake levers and twist the throttle open. Now, while this might not speed up the engine restarting process, the auto cut-off will definitely help with improving efficiency. In fact Hero claims that with the system enabled, they saw a 10 per cent increase in fuel economy. And while Hero hasn’t made any official mileage claim, we were told that one could expect above 50kmpl. As for other features, it’s not like the Destini is loaded. The Vx variant gets a light for its underseat storage as well as a USB charger, while these are optional in the Lx variant. As standard, it gets an external fuel filler located aft of the seat, which, along with the seat, can be opened from the 4-in-1 combination key lock at the ignition. However, there are no LEDs present in any of the lights, just conventional bulbs. While the feature list might not be high, one thing the Destini does nail is the riding position. Again, Hero hasn’t specified the rider’s seat height, but it does feel slightly on the higher side. That said, the seat itself is very comfortable and the low-set floorboard coupled with the high-set handlebars makes for a great riding position. So even if you’re on the taller side, the handlebars won’t make contact with your thighs or knees when taking tight U-turns. And then even the pillion seat is comfortable enough for larger-sized pillions. When it comes to that typical scooter practicality though, you’ll be left a bit wanting. The floorboard is certainly large enough to accommodate fairly large bags, and it gets two luggage hooks as well. But it does miss out on cubby holes on the front apron. Hero does offer an apron storage box as an accessory, though that will cut into knee as well as floorboard room. And then the underseat storage is just 19 litres - not really the best in class, but should still manage to fit a standard half-face helmet. On the small test ride we had around Delhi roads, the Destini’s ride quality did prove to be quite good in most conditions, though it’s not as plush as the Honda Grazia’s. It packs telescopic forks up at the front, which do feel slightly stiffly sprung, and a single shock at the back that’s a tad on the softer side. It’s only on the very sharp bumps that the front can feel a bit jarring. On the other hand, the rear handles these bumps really well if you’re riding solo. With a pillion on board though, the rear does tend to wallow over larger undulations, though it feels far better controlled than something like the Honda Grazia. We didn’t really get a chance to test the Destini’s outright handling, but darting in and out of traffic was done with a fair bit of agility. But at the same time, there was enough confidence while changing directions - something that was a bit surprising for a scooter that runs small 10-inch wheels and slim 90/100 size tyres at both ends. In a bid to keep costs down, the Destini only gets drum brakes at the front and back on both Vx and Lx models. While braking performance feels adequate, and combined brakes are equipped as standard, we really do wish Hero would’ve at least given the option of a front disc setup. To answer our original question whether the Destini does enough to differentiate itself from other family-oriented 125cc scooters, we’ll have to probably answer in the negative. Yes, the start-stop system is certainly a feature that we’ve not seen before in any Indian scooter, but we have our doubts whether that alone will be enough for the Destini to shine in the minds of the Indian two-wheeler buyers. And even in terms of performance, there’s not much that this latest Hero is doing different. 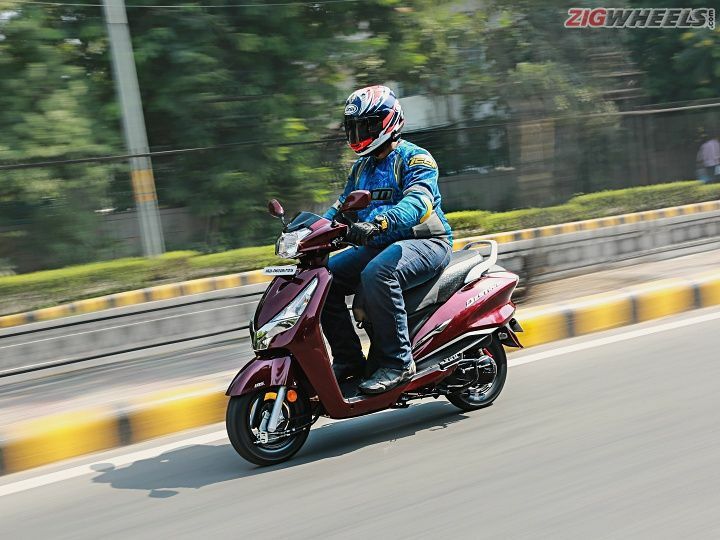 But where it does stand out is in terms of price, because starting out at Rs 54,650 (ex-showroom Delhi) for the Lx variant, it’s Rs 5,271 more affordable than a similarly equipped Activa 125, and it even manages to undercut the Access by Rs 1,016. Even if you factor in paying Rs 57,500 for the alloy wheels, chrome garnish and additional accessories of the Vx model, you’re still looking at a great value proposition in the 125cc scooter space: Rs 4,358 lighter on your pocket than the Activa 125 with alloy wheels and drum brakes. And this value proposition might just be the incentive that the family scooter buyer needs to jump onto the Destini brand. Share your experiences with Destini 125? Confused about Hero Moto Corp Destini 125?